A LOT of carp anglers hate fishing in and around weed. I don’t know why, because I love it. I love it for one very good reason – most weed contains a lot of natural food and carp feed there as a result. They also use weed to shelter in and during winter if there’s weed around the chances are the carp will be in it. 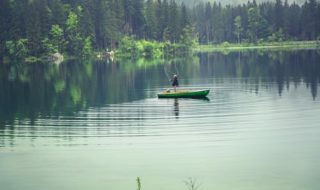 So, the next time you turn up at a lake and find that it’s weedy, before you start panicking and complaining that you can’t find a clear spot, have the confidence to actually fish in the weed. You could be surprised at the results you get. Obviously, I’m not talking about, or advising, that you fish in really thick weed that’s feet deep. You must be able to get carp out of the stuff when you hook them. What I am saying is that weed two or three feet thick can be fished without any problems at all. You don’t need to find clear spots to catch, though you DO need to know about appropriate presentations that will give you more chance of getting your hook bait picked up when it’s in weed. And that’s what this article will be about. I use a number of rigs depending on the situation I find myself in – whether that’s distance fishing, margin fishing or surface fishing – and the same applies to weed fishing. 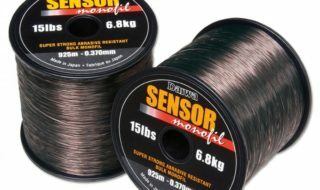 With a little thought there’s no reason why your rig shouldn’t cope with the green stuff you are fishing in. Perhaps the best way of fishing over any type of weed, but particularly silkweed, is to use a sheet-type PVA bag and bury your hook and lead inside it, along with some pellets. Any make of solid PVA bag is fine, including those from Gardner, Richworth and Kryston. However, my choice is for Temple Products bags in micro size. These seem to be far more user-friendly than other sheet-type PVA bags I have used. They are easy to fill thanks to a flap that helps you pull open the bag, they don’t dissolve instantly (you’ll see why this is essential in a moment) and they are strong. If you are casting some distance with them the lead won’t break through the bag on impact with the water. It’s important to pick a bag that doesn’t dissolve in a second or two for one very good reason. You need your bag to stay intact as it falls through the water. You want it to touch down on the weed before it melts. Because the bag has a large surface area, it won’t drag down into the weed, ruining presentation. Instead, it sits on top of the weed until it melts. Then you’re left with a nice little pile of freebies, together with a hook bait that the carp can find and eat completely unhindered. Because I tuck the hook point into the PVA as I prepare the bag, I know that after the PVA has dissolved, my rig will not be caught up in weed and therefore will work more efficiently. This is the length of Sufix Stealth Skin you should start off with. Note how much outer coating Steve has stripped back. Tie on a size 6 Centurion hook using the knotless knot. Note the flexibility of the hook link beneath the hook. You need to make the hook link around seven inches long. At the other end, tie on a Carp ‘R’ Us Gizmo like this. This is what the Gizmo looks like with the rubber over it. This gives security, ensuring the hook link won’t come off the swivel. Take a micro-sized Temple Products bag. Push a stringer needle through it, coming out of the middle of the bag. Now thread your hook link through the bag. Note that the hook bait has already been threaded onto the hair. With the hook link running through the bag, fill it with pellets. The Gizmo should come out of the centre of the bag. Moisten your finger with saliva, then gently coat the entrance flap with it. This will enable you to seal the bag. Neatly seal the bag, adding more saliva if you need to. This part of the process is the most tricky part. At the bottom of the bag, ensure the hook point is pulled into the PVA so it can’t catch up on any bottom weed. Here’s the finished weed bag. This is also how it should look as it touches down on top of the weed in your swim. Before casting, clip your hook link and bag onto the Gizmo like this. Then cover the Gizmo with the rubber. This is how the PVA bag rig should look just prior to casting. Steve likes to put his lead on a standard lead clip. Before casting, to ensure the bag doesn’t float, pierce it a few times with a baiting needle so excess air can escape. This is how the bag will look on the weed after it has dissolved. Your hook bait should be perfectly presented. I do not place the lead inside the PVA bag, because I tend to use smaller bags than most anglers. I’m a great believer that smaller bags are more effective than big bags, possibly because, on pressured waters, carp can spook off the piles of bait created by larger bags and also by spodding. 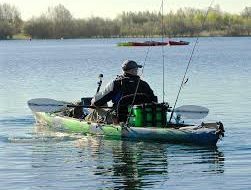 Remember that PVA bags are no longer a new technique – most waters in the country these days have been hammered on them. Certainly, my experience on a syndicate water near Reading that I fish would indicate that small PVA bags are best. Anyhow, what I do is thread the hook link through the bag before filling it with bait. The rig I use for this is a simple combi-link made from 25lb Sufix Stealth Skin, which is more than strong enough to haul big fish from weedy areas. I tie one end of the hook link to a size 6 Carp ‘R’ Us Centurion hook using the knotless knot, creating a hinge an inch or so from the hook by removing the stiff outer coating of the hook link. I tie the other end to a Carp ‘R’ Us Gizmo, after threading a Gizmo rubber onto the hook link. This is a brilliant little tool that allows you to remove your hook link in an instant from your swivel (see pictures). Once the rig is tied, to make my weed PVA bag presentation I firstly thread a stringer needle through the bag. I then pull the hook link through it so the Gizmo ends up at the entrance of the bag and the hook bait at the solid end of the PVA. I then seal the entrance of the bag by carefully licking my finger and dampening the PVA flap. The saliva will be enough to seal the entrance of the bag, with the hook link running through it. I ensure that my hook link is only a fraction longer than the length of the Temple Products Micro bag. It’s important that you don’t have too much hook link showing outside the bag. If you look at the photos, you’ll know precisely what I’m getting at. At this point, the bag isn’t attached to the main line. To do that I just hook the Gizmo over the swivel that’s in the lead clip, then cover the Gizmo with the rubber just to ensure the hook link can’t come off. Then it’s just a case of casting out the bag – which will give you a very good presentation for weedy swims. Solar Rig Foam is what you need – Steve loves it and wouldn’t fish without it in and around heavy weed these days. To apply the foam to the hook, lick it first. This will allow you to stick the foam down in place over the hook. Fold a piece of foam over your hook like this, with the damp sides joining. This will stick the foam over the hook perfectly. Leave the hair hanging loose like this. You can actually use foam with any standard hair rig and hook bait. If the weed is really thick, try tying a pop-up on a long hook link that will sit just above the weed. Put foam on that, too. As well as PVA, I’m also a massive fan of rig foam. When this came out on the market from Solar a few years ago, I was sceptical at first as to whether it was a gimmick or not, but I soon came to see its uses – one of which is to help your presentation in weed. It doesn’t matter what rig you are fishing – it can be a zig rig, a bottom bait rig or a pop-up – foam can be used to keep your hook link off the bottom after your lead had touched down. It works like this. You wrap your hook in a piece of foam. Then you cast out. Your lead splashes down and sinks through the water, hitting the lake bed with a ‘clonk’. However, the rig foam should still be on the hook. Because the foam is still on the hook, it will keep the rig up in the water, above the weed. Then, after a minute or so, the foam will dissolve. This will leave the hook bait to gently sink down and rest lightly on whatever weed might be present. You can use this tactic with a balanced pop-up or a balanced bottom bait. Obviously, the more neutral your hook bait is in terms of its buoyancy, the more gently it will come to rest on the weed – hopefully giving better presentation as a result. One thing about lead clips that I really don’t like is the fact they all need to be doctored, in my opinion, to make them safe. I have heard rumours that one well-known company is about to bring out a completely safe lead clip, but I haven’t seen one yet. The main cause of danger when it comes to tethered fish is the lead. It’s the lead hanging from the line that’s most likely to get caught in weed or a snag, trapping a fish, therefore it’s the lead that’s got to go should you lose a fish during a fight. The only way to absolutely guarantee that is to cut the clip back and ensure you don’t trap the lead on the clip by pushing the tail rubber too tightly over it. To make the lead clip safer still for use in weed, I tie a boom to the lead before attaching it to the clip. To do this, I tie some lead core or thick mono to the lead’s swivel, then thread some wide-bore Solar silicone tubing down it – the tubing you get in their Eazi-fit ‘snap link lead clip’ kits. I then tie a uni-link swivel to the other end of this lead core, and place the large ring on the swivel into the clip. The boom makes the rig safer in weed for the following reason – weed will build up on it, causing more resistance that is more likely to pull the lead out of the clip. Therefore, a hooked carp is more likely to shed a lead with a boom, than one without. Steve uses the silicone in these Solar rig packs to protect the boom he ties to his lead and to stop tangles. To create the boom, tie some lead core to the swivel on the lead. Then thread the silicone tubing down the core. Create a boom that’s two inches long. Tie a uni-link swivel to the end of the boom, ensuring it’s covered by the silicone. Attach the lead, complete with boom, to a doctored lead clip. Tie on a rig and you’re ready to go. 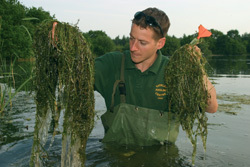 When fishing in weed, the extra resistance created by the build-up of weed on the boom will pull the lead from the clip. To make any lead clip rig safe, doctor the clip by cutting it back. This allows the lead to come off totally. Finally, another little trick I like to use over light weed is the ‘cork-in-the-middle’ rig. This is perfectly suited to pellet or dumbbell-style hook baits and, while it isn’t new or original, it is perfect for weed fishing as your hook bait is critically balanced and will gently sink onto the weed rather than into it. To make it, all you need are some cork plugs. I use them with the new dumbbell-shaped Squirrel hook baits we sell at Yateley Angling. I cut a dumbbell in half and smooth the inside of the bait by rubbing it on a flat surface – wood is ideal. I then thread the two half-dumbbells onto a standard hair rig with a sliver of cork placed between them. With a bit of experimentation you can achieve a hook bait that is so well balanced it will sink to the lake bed over the course of a few seconds. This also has the advantage of cancelling the weight of the hook that’s attached to the bait – making the hook bait behave more like a freebie. You’ll need a cork plug and a dumbbell-shaped hook bait. Yateley Angling’s Squirrel hook baits are perfect for this. Cut a sliver of cork from the plug. Experiment to find out how much cork you need to balance the rig completely. Smooth the flat ends of the dumbbell boilie on a flat surface. Smooth wood is perfect. This helps presentation. Finally, thread the two half-dumbbells on a hair and place the sliver of cork between them. The result? A perfect weed rig! Finally glug the bait in your favourite dip for some added attraction. So those are my thoughts behind rigs for weed. This time of year is when the weed, if present, at your lake will be approaching its worse. So try the rigs out. I’m sure you will find you’ll catch on them. 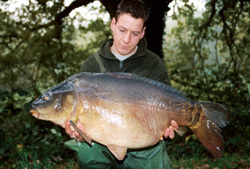 This 34lb mirror was caught from a weedy swim… It can be done! And remember – these presentations will also work very well over smooth, silty bottoms and gravel. Just make sure that if you do use them over weed, you’re also using tackle that’s capable of landing a big carp. I use strong hooks, strong hook links and 20lb main line if I have to. So should you!